I don't have much to show you today and as I'm feeling a little out of sorts at the moment, this post will be pretty short. I decided to doctor my No.7 'Queenie' manicure last night because I got bored with seeing a plain manicure. For this I sponged on Eyeko's Vampira Polish, used some silver polish to stamp the images from Bundle Monster plate no.2 and topped it off with a little holographic glitter polish. I'd been waiting for an opportunity to use the lips images. Until next time, kiss kiss...geddit? Oh, how lovely. I like the gradient effect. Great stamping. This mani is absolutely beautiful! 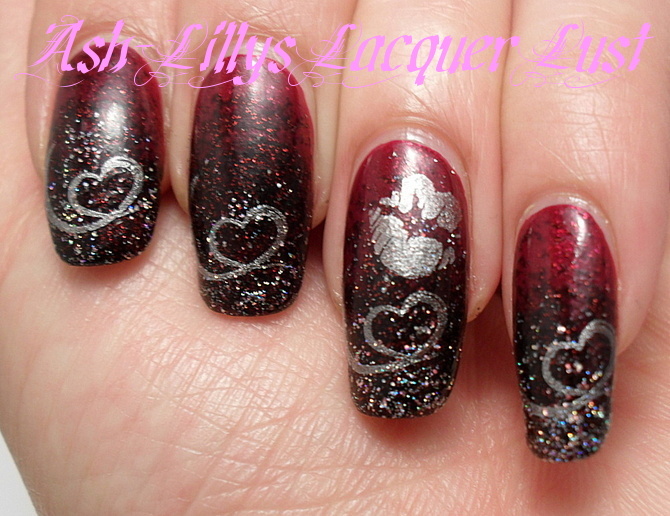 Love the gradient I am horrible at making them blend!. 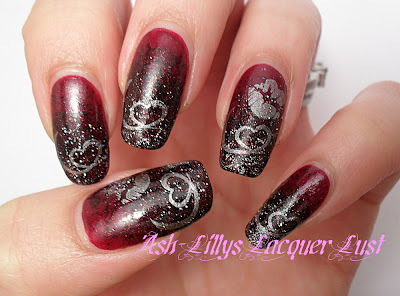 Lovely mani, would be perfect for valentine :)!